As the cloud computing model of IT delivery becomes ever more clearly defined in terms of its scope and capabilities, the more widespread use of its services is being seen in mainstream commercial operations from retailing to new forms of online media. Computer Weekly last reported on Domino’s Pizza approach to information technology here, with an interview with Colin Rees, who is IT director for the company. This week, we learn of Domino’s buying into RackConnect, an integrated cloud hosting and dedicated managed hosting service from Rackspace. The new service is designed to give Domino’s a scalable and cost-effective platform that will support the execution of the company’s ambitious growth strategy. Key to Domino’s success (says the company) is a multichannel retail strategy, which generated a 63% increase in online revenues alone in 2010. “To help drive revenue and future growth, Domino’s sought a hosting service that would meet the evolving demands of its online business — and allow its internal IT team to focus less on the maintenance of its online properties and business applications and more on innovation,” said the company, in a press statement. Rackspace senior VP David Kelly has said that the fact that Domino’s Pizza has chosen the RackConnect service highlights a common need amongst businesses for a hybrid hosting platform that offers them more flexibility. Rackspace says that RackConnect will enable Domino’s to select which applications are placed where in the managed hosting infrastructure. … and the only bad news here? 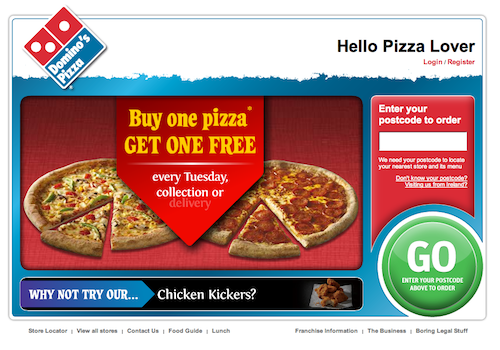 Domino’s TWO FOR TUESDAY offer was yesterday, so you’ll have to wait until next week for your double deep pan pepperoni passion OK?